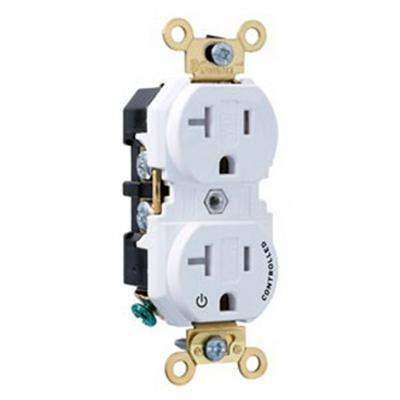 Leviton 2-Pole 3-Wire Extra heavy-duty straight blade duplex receptacle in white color, has voltage rating of 125-Volts and current rating of 20-Amps. Self-grounding receptacle withstands dielectric voltage rating of 2000-Volts. It has impact-resistant nylon face and body. This receptacle accommodates 14 - 10-AWG solid or stranded wire. This 0.04-Inch triple-wipe brass offer superior conductivity. This 1-plug controlled receptacle has brass-hot, green-ground, silver-neutral terminal connections for easy identification. It has 0.05-Inch brass strap for easy mounting. Receptacle measures 3.63-Inch x 1.32-Inch x 1.27-Inch. Eight back-wire holes per termination ensure added wiring flexibility, eliminate pigtailing and save box space. Receptacle withstands temperature rating of -40 to 75 deg C. It is suitable for long service life and high-performance applications in homes, offices, schools and other settings. Industrial grade receptacle has NEMA configuration of 5-20R for added safety. It has V-2 per UL94 flammability rating to withstand harsh environmental conditions. Receptacle is UL listed, CSA certified and meets ANSI/NOM standards.